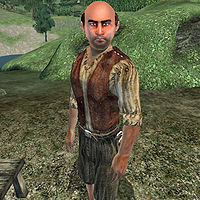 Aloys Bincal is an Imperial farmer taking refuge at Crestbridge Camp a little ways from his farm at Cropsford. Aloys, his wife Callia, and his fellow farmer Barthel Gernand are having a little trouble with nearby goblins wreaking their new farms. Barthel will give you a little background about the farm, telling you that "We plan to call it Cropsford. My daugher Callia, her husband Aloys, and I, came all the way from High Rock to start a new life here." Once the quest is complete, he adds "I'm happy with our progress so far. I feel better knowing that Callia and Aloys have a home again." When he greets you, he'll simply say "Hello. I hope the goblins along the Yellow Road didn't give you any trouble." Then "If you need anything, talk to my father-in-law. This whole expedition was his idea." When asked about Barthel, he'll reveal his hostile feelings towards him, saying "Barthel Gernand. He talked us into selling our comfortable house in High Rock to start a new settlement here in Cyrodiil. He read something about cheap land being offered by the government. Of course nobody said anything about the swarming goblins." When asked about the Goblins, he'll say "We had just set up at Cropsford when Mirisa came running in. Said goblins were heading our way. We barely escaped with our lives!" If you ask Aloys about Cropsford, he will have several comments, all based on how much progression has been made with the construction: "If you ask Barthel, it's the garden spot of Tamriel. See for yourself. It's just northwest of here. But watch out for the goblins." Then "I guess we won't be going back to High Rock after all. Cropsford is going to be our home now, for better or worse." Then "I'm starting to think this is going to work. Maybe Barthel wasn't crazy to bring us here after all." Then finally "I like it here. I really didn't think I would, but Cropsford feels like home now. Thanks for making this possible, my friend." Aloys wears breeches, rough leather shoes, and a patched vest. He also carries a meager amount of gold. Esta página foi modificada pela última vez à(s) 03h46min de 1 de julho de 2013.